While on the stationary bike today to give my knees a break, I started thinking about a training log. Runkeeper gives me some figures but I nerd out on numbers and it’s never enough. I love my spreadsheets (to the extent that I might go back and make a “spreadsheets” tag for my obsessive posts)! While I love the information they give me, I don’t know how to make them give me that number so I opened the laptop, and 23 tabs to try and figure out how to calculate pace. After getting lost on things like this and decimal hours, and ending up with things like a 17 hour pace! I quickly went back to my old standards and bugged Robby and Marcelo who are the Excel whizzes behind #GoTheDist and my steps spreadsheet, respectively. Between Robby’s link and some more research, I found a template that did the math for me and I now have a running log. 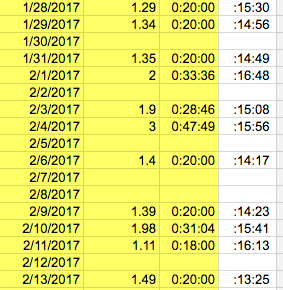 I ran almost the same distance (.61 miles) on my first day and almost six weeks later on February 18. Result? 3 minutes faster, :15:00 (.6 miles) vs. :19:40 (.61 miles) and a lot more jogging than walking. My times and distances are all over the map so it’s hard to see any pattern. I think that will settle out now that I’ve found a more comfortable pace from which to build base. Even though I’m going at a slower speed in the jogging intervals, I’m jogging for longer so my overall times are faster. I still don’t know where this is going, but as with all other moving projects, the spreadsheets help so I look forward to delving deeper into this in March. Tomorrow: my insane February #GoTheDist and possibly a revised Q1 goal.